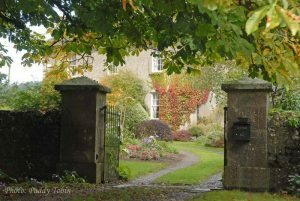 How many times when visiting a garden is it a novel aspect that stays in the memory – the odd plant, or the unusual building? Grottoes, often built around a natural spring, made to look ‘natural’, and well hidden among vegetation, often have an endearing charm. A shell house by comparison is more usually a small building, of distinctive shape, and decorated with sea shells, though one used thousands of snail shells instead. The degree of decoration can vary, from simple lines or features, to a full wall and ceiling covering. Time consuming to make, expensive now to maintain and restore, they are always going to be a rarity, and with a most appealing appearance. Gerald and Margaret, both of whom spoke – and Gerald did the poetry – have extensively travelled Ireland and Britain, researching and photographing shell houses especially. 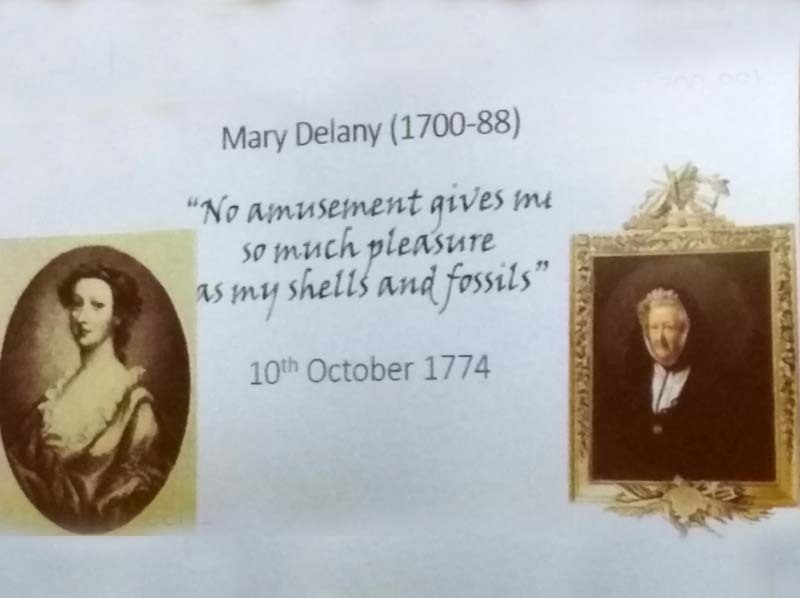 The lecture focussed mainly on the work of Mary Delaney 1700-1788, a noted English botanical artist famous for her ‘flower mosaics’ (decoupage) using coloured paper, and a remarkable woman indeed, who lived for many years at Delville House (now demolished) in Glasnevin, Dublin. Her interest in sea shells started as a daily escape at age 17, as her marriage was arranged to 6o year old Alexander Pendarves MP, and they lived at Roscrow Castle near Falmouth, Cornwall, for 4 years until he died. With a natural artistic ability, the shells became an inspiration, and she started making ‘swales’, a gentle line of shells across, for instance, a fireplace. This developed in time to fully covering walls and ceilings in complicated patterns and designs. Commitment was intense, one shell house took 7 years to finish. The pictures showed the detail, complexity, and charm of the shell decorations, especially when the panel shown was maybe 18inches square, with maybe 200 shells used………………but it was part of a ceiling of 100 such squares. Amazing patience and attention to detail needed. 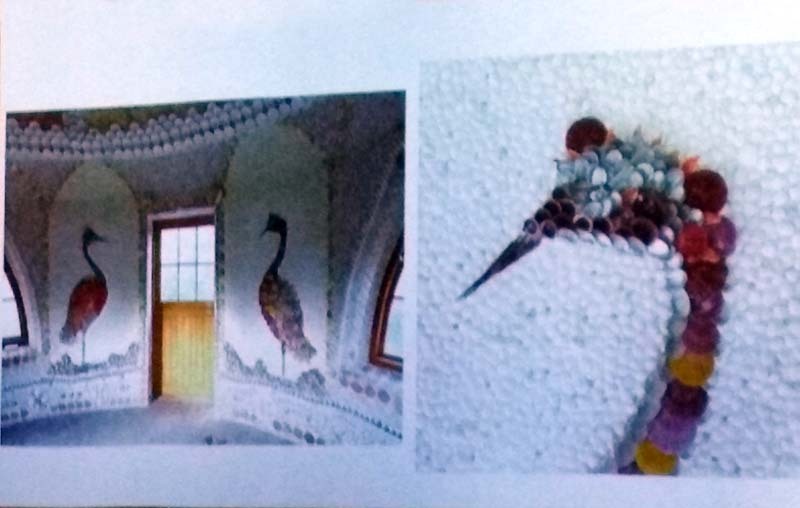 Of the examples shown Carton House in Kildare, made with not just shells, but tufa, corals, ceramic eggs and a remarkable pine cone feature was noted as well preserved, but more needed. Curraghmore House in Waterford shell house was made in 1754 by Catherine Countess of Tyrone, by ‘her proper hand’ and it took her 261 days. The speakers said this is the best example in Europe of a shell house, with a unique trefoil design, with many exotic tropical shells – Catherine apparently asked Waterford’s ships captains to bring her back shells from their worldwide travels. The speaker’s interest was first stirred when they saw the shell house at Ballymaloe, a modern take on the idea, using left over oysters and mussel shells from the cookery school. Work continues in other gardens too, with some wonderful designs of animals or birds in flight. There are two very big differences nowadays though. Firstly, shell artists no longer need to boil animal hooves and pigs blood to make adhesive (praise be!). Secondly, shell collection is now very strictly controlled as many of the original inhabitants are at risk, and are listed as endangered, no trade allowed. 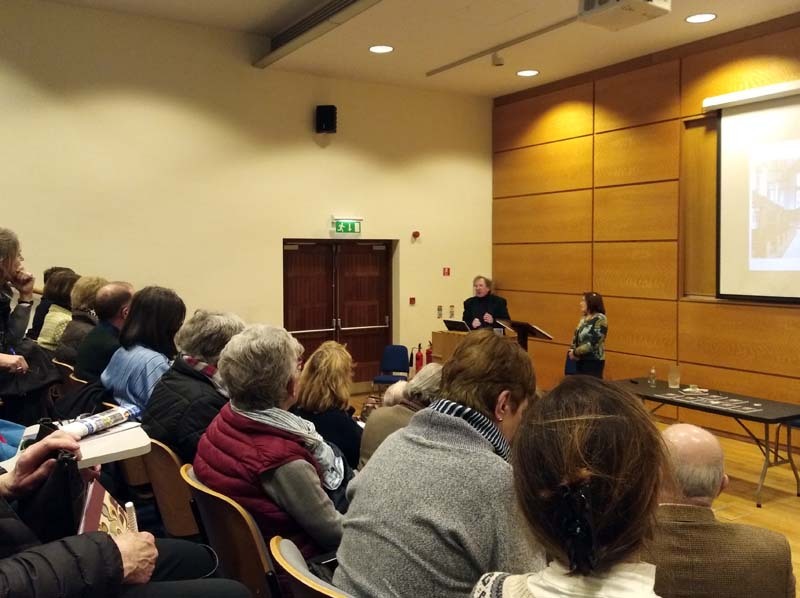 This was a thoroughly enjoyable and informative lecture, with 75 people attending, and a keen interest in the recently published books by the speakers. 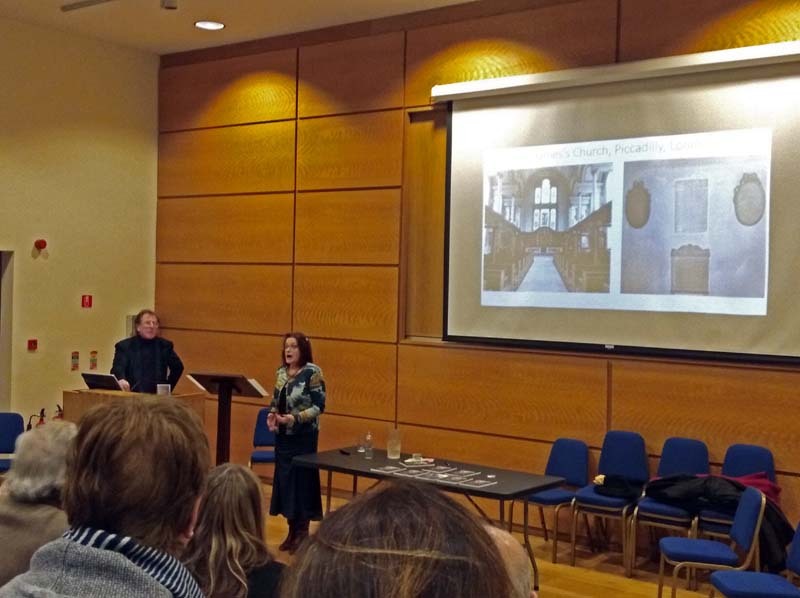 This event was organised by IGPS Leinster.